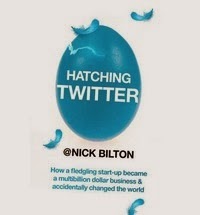 Hatching Twitter, is a true story about twitter. It reveals what kind of people the co-founders are - Evan William, Jack Dorsey, Biz Stone, and the lesser known Noah Glass. They were all brilliance young men, usually poor, and very much like hackers. Jack Dorsey is singled out and portrayed as the most evil-egoistic-narcissist in the story. He started out as a nerd, like a Mr Forrest Gump, and had a nose ring! And he imitates Steve Jobs. And the book is fairly accurate. Even if it is not, I enjoyed the book very much as it is a well written story with insights to startups and product development. I turned page after page to know what Ev would do to the company, and to his colleagues/friends. I bought a copy at $20 from book depository. A highly recommended read.